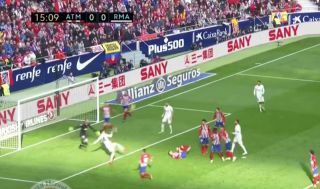 Casemiro scored a fantastic acrobatic goal to hand Real Madrid a 1-0 lead over rivals Atletico Madrid in the Madrid derby this afternoon. Real could go just five points behind league leaders Barcelona with a win today, something Real fans would’ve thought they would be seeing happen after Casemiro’s goal. The strike came after a header from a corner fell to the Brazilian, who fired home an acrobatic scissor kick to give Los Blancos the lead. Atletico have since equalised, however Real have now since take the lead again, something that means fans of Real will be confident in seeing their side beat their local rivals this afternoon. Casemiro’s goal can be seen below. Quality finish from the midfielder! That sat perfectly for Casemiro. Lovely finish.